Multicoloured baubles of every conceivable shape and size are widely available to buy, but it is a great idea to try making Christmas tree decorations yourself. 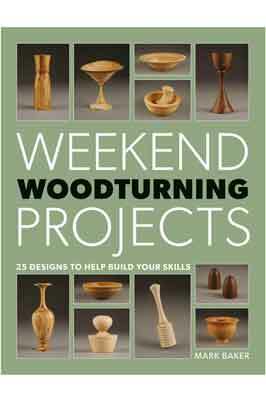 This ornament is a wonderful way of using all the skills you have learned so far in this book in a different kind of project. If you use low-density wood such as softwoods, you could make thin icicles in one piece without them being too heavy. This is a form made in three parts and I am using rippled maple (Acer saccharum) for the body - a small hollow form - and African blackwood (Dalbergia melanoxylon) for the top for contrast and the lower icicle-like drop finial. Choose what woods you like and play around. There are so many shapes to go for. Let's start with the body. 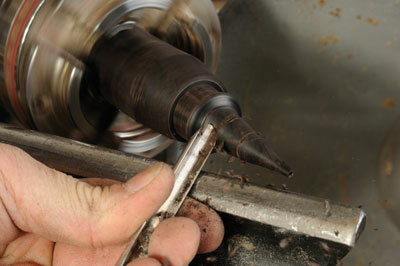 Mount between centres and create a cylinder, then cut a spigot one end. 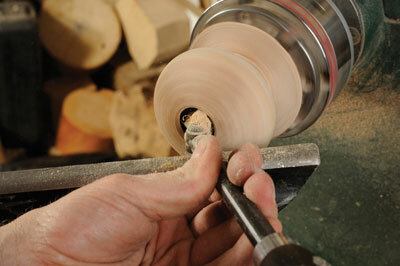 Use a spindle gouge to create the body shape you want. I chose a squat bead form. You can drill or use a spindle gouge to create a hole right through the piece, before opening up the hole near the tailstock to accommodate the bottom icicle-type drop finial. This is the hole you will be hollowing out through. 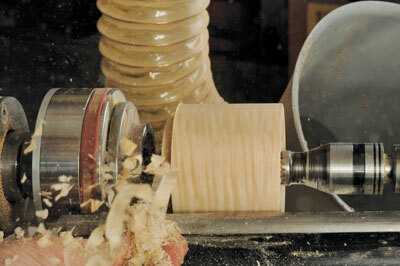 By using the gouge, you can use the hollowing technique shown in the simple box project. You will not, however, be able to reach fully under the rim. 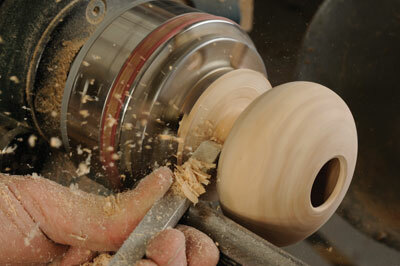 Also, do not go too deep or the piece will not be stable for hollowing under the rim. You can effectively hollow out by sweeping the gouge from the centre out in a fan shape that, once done, is all you can do with the gouge. 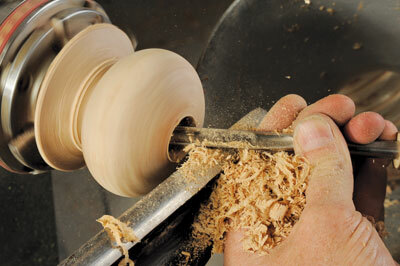 The downside of working through a small hole is you have to stop and clear out the shavings regularly. 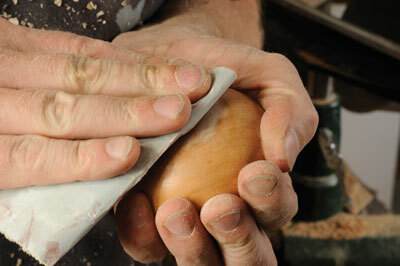 To achieve the shape required for this project, use either a shaped scraper or a scraper or cutting tool that allows you to reach around the shoulder. 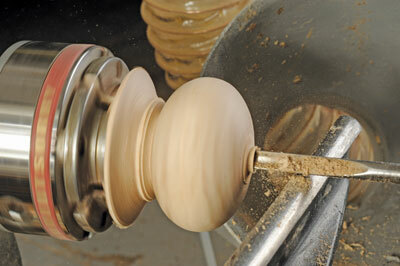 A swan-necked, articulated or swivel-tip scraper will do this. If you do not have one, just change the body shape so you can reach all the areas with a gouge or standard straight scraper. Whatever you use, adjust the opening shape to make sure you can move the tools to where you need to get to without hitting the side walls. 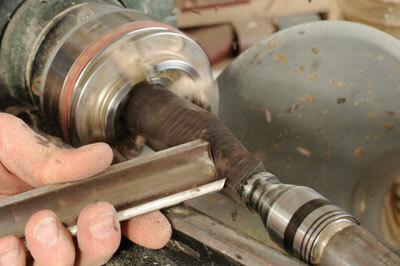 The tool should be supported on the rest by the main shank of the tool and not by any other part. Angle the cutter to reach where you need to go and make gentle cuts above the centre line of the form and never below it. Once you have run the cutter around the inside and have an even wall thickness, use a beading and parting tool to reduce the waste on the chuck-side of the form. Now sand and apply a finish of your choice. Again, I used oil. Part off the work. 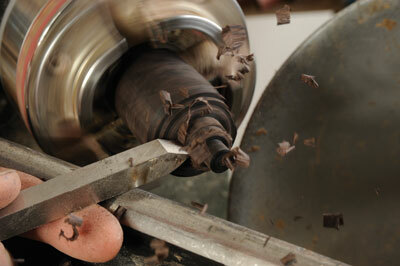 No part of me is near the chuck so I am clear to hold the work gently while I part it off. Remember there is a hole running through the piece. 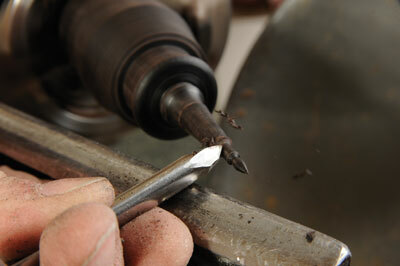 Once parted off, clean up the upper end of the piece and apply your choice of finish. 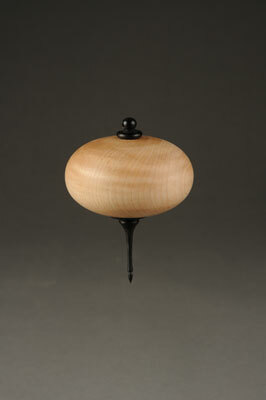 The lower finial is a section of a timber of African blackwood from what is sold as a clarinet bell blank. One of these quadrants will do four complete projects like this for me. Being square, the thickest end can be gripped in the central section of your chuck jaws. 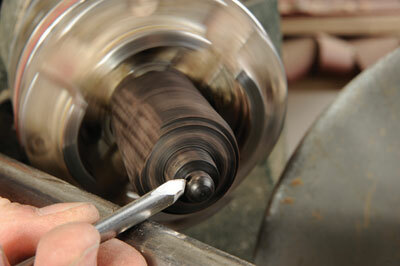 The revolving centre can be brought up to support the piece while creating the taper. 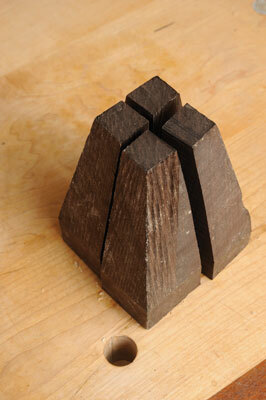 African blackwood takes excellent details but is dusty to use. Measure the opening of the widest hole. 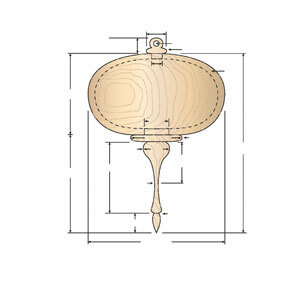 Measure the overall length of the finial required then use the beading and parting tool to cut the spigot to the right diameter to suit the length previously measured. 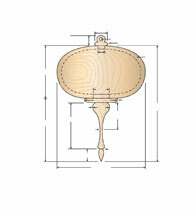 This now establishes the mating joint and also the overall length of the finial. 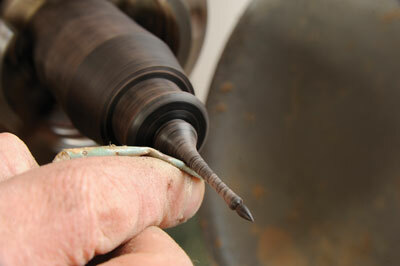 Then use the spindle gouge to start shaping the finial. 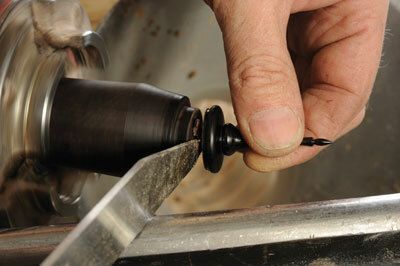 Use a spindle gouge to shape a partial bead on the part nearest the dimensioned spigot. Note how there is a wider section at the pointed side of that tenon. This will allow the tenon to fit in the hole and provide a shoulder that covers the hole as well as providing a nice detail. 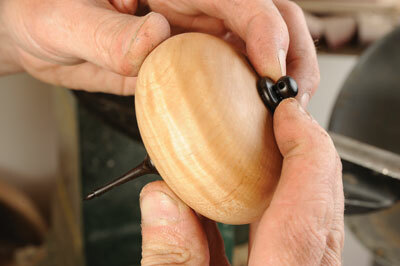 Now shape the tip end of this bead and then start to refine the finial shape, working from the very tip back to the bead. 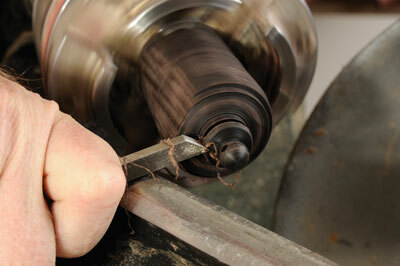 Blackwood cuts cleanly if a shearing or peeling cut is used. As with previous finials, create the main curve of the finial slowly and carefully, again the thinnest part is about one-third of the way down from the top. Near the shoulder the stem is rolled over to create a nice intersection with the beaded shoulder area. Apply your finish. Oil and paste wax was used in this case too. 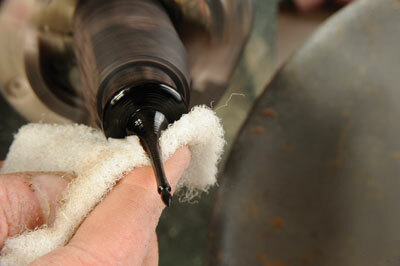 As before, apply only gentle pressure, then buff with paper towel. 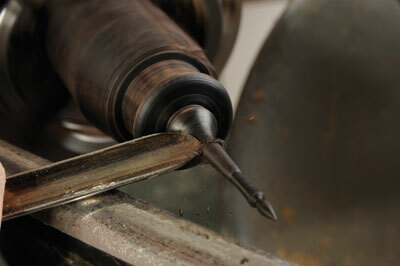 Now part off the piece through the tenon cut. You need to leave enough on the finial side to equal the wall thickness of the hollow form so it has as much glue area as possible to bond properly. Now try it for fit. You can see here how it should fit in position nicely. Check that the bead detail and shoulder work well visually. 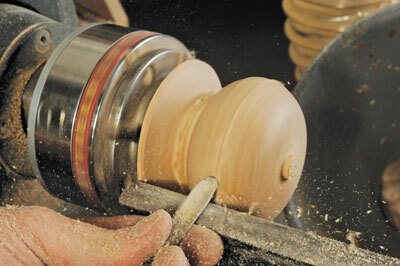 Now flip the hollow form over and measure the hole created when you pushed the drill or gouge horizontally into the wood. 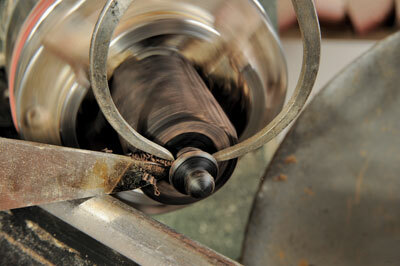 Now create another tenon on the blackwood held in the chuck, making it slightly bigger than the hole opening, and use a spindle gouge to cut a little ball on its front end. 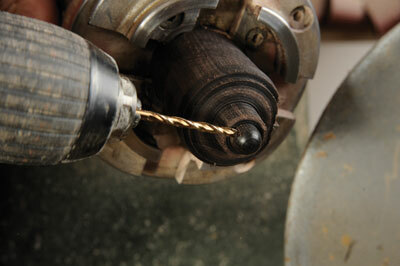 Once cut, drill a small hole horizontally in the centre of it. 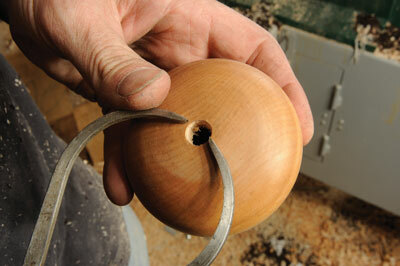 The hole only needs to be big enough for some fishing line or a ribbon to be passed through it. 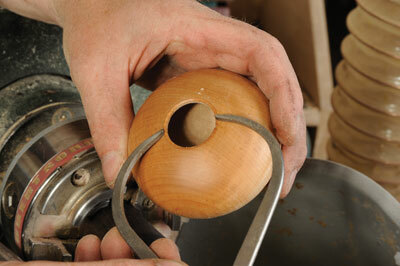 Once drilled, refine the shape of the ball. 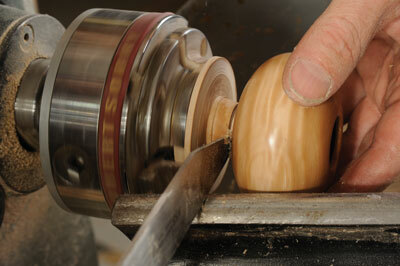 Turn a bead form on the shoulder of that previously cut tenon, at the base of the ball. 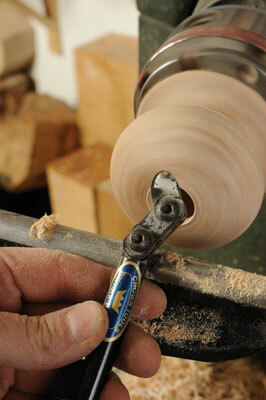 The forming tool works well for this, but a gouge or parting tool would do too. Now create a spigot of the right size to fit in the hole. You can see how callipers and a thin parting tool work well for this. The spigot needs to be overlong so you can part off the right length. The other thing is to undercut the top-most shoulder of the beaded part so this sits flush against the hollow form. Do not part it off yet. 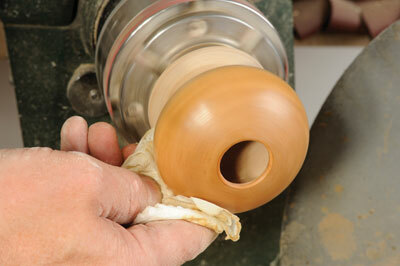 Now sand the piece carefully and then apply your finish. Buff it with paper towel, then part it off. 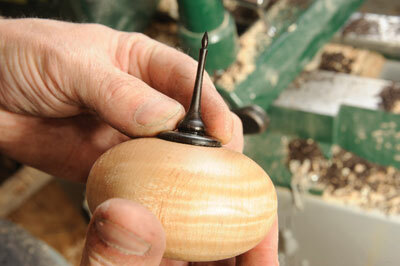 Now glue the lower finial and upper button in place.